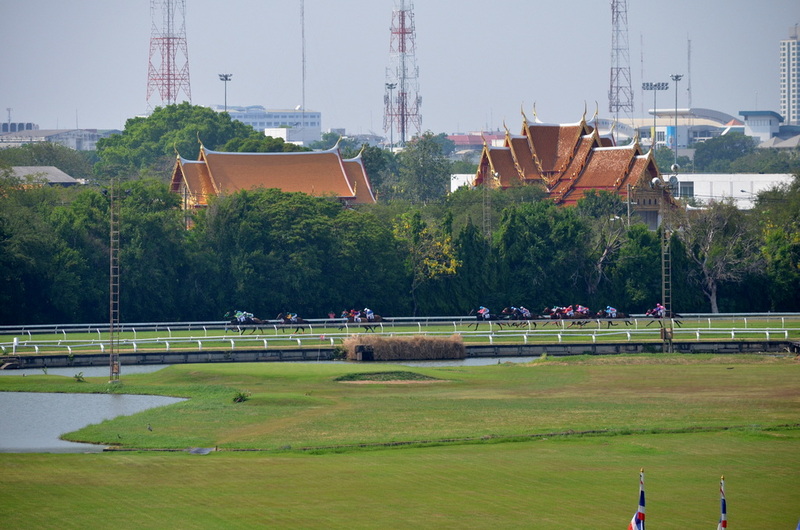 On a Sunday afternoon, an American traveller discovers a favourite Thai pastime: racing horses at the Royal Turf Club — Four Seasons Magazine. My wife and I visited our daughter Emilia in Thailand in March 2013 when she was there as an elementary school teacher. During our first weekend there, she and her friend Ian showed us a side of Bangkok beyond Buddhas, tuk-tuks and Khao San Road. They took us to one of the city’s two race tracks. It was an incredible experience, and Four Seasons Magazine bought the story. The story can be read here. Ian, channeling Bukowski, on the rail studying the odds before the next race. Excerpt: Ian goes to the rail to study the horses. He’s channeling Bukowski with a smoke in one hand, a whiskey in the other. I hang behind him, taking in the scene. The lush grass track is bordered by a row of blooming rose bushes. The infield has ponds, palm trees and a par-3 golf course. The jockeys in their colourful silks look young enough to be my daughter’s middle school students. And, as if to emphasize that we’re a long way from Churchill Downs, the peaked rooflines of the lavish Marble Temple shimmer in red just beyond the first turn. This entry was posted in Travel and tagged Bangkok, horse racing, Royal Turf Club, Thailand on April 8, 2015 by Justin Catanoso.